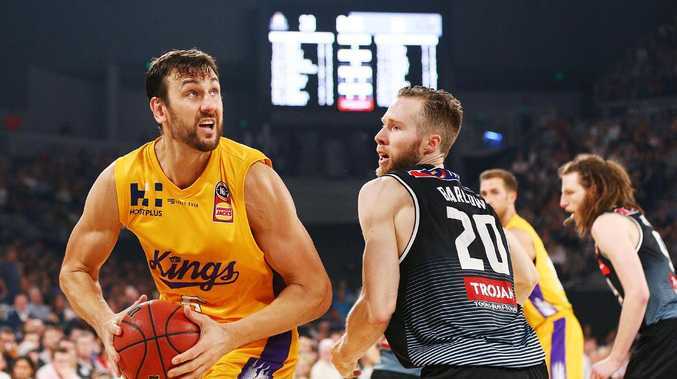 NBL owner Larry Kestelman has his sights set on NBA stars, including Joe Ingles, Patty Mills and Matthew Dellavedova, finishing their careers in Australia following the success of Sydney Kings marquee Andrew Bogut. The NBL posted bumper mid-season attendance figures on Thursday - largely driven by drawcard Bogut. Bogut has helped the previously underperforming Kings record a 32 per cent jump on last year. Reigning NBL champions Melbourne United, who shared attendance spoils last season with Perth Wildcats, have averaged crowds of 8175 at the midway point - one per cent down on last season (8257). United has sold out two of its nine home games at Melbourne Arena - both against Bogut's Kings. Secret talks with Australian NBA stars has bolstered Kestelman's dream for the domestic league to become a destination for Australia's best players. "We started talking to Andrew (Bogut) when he was literally at the height of his career, three or four years ago, and we're doing exactly the same with all of our Australians players in the NBA," Kestelman told the Herald Sun. "The signs are very, very positive, we feel there'll be a number of them and it will become almost a little bit of a norm now that the league is where it is, I have no doubt that they all want to, at some stage, come back and play here." Average attendances have increased by four per cent across the league. Of the 55 games played so far, 30 have been decided by single digit margins despite a spike in average points (89) scored - up from 84 points last season. "Hand on heart I believe we're the second best league in the world by the product that we present and I don't think there's anyone in the world that would argue with that," Kestelman said. "I don't know if we truly appreciate what standard of the game that we play here, it's extraordinary. "We're on par with the NBA on scoring (per minute), number of dunks are up, the closeness of games, all of that is creating an amazing product that we can enjoy for decades to come."